Weedcraft, Inc., a new tycoon-style management sim released yesterday on PC and Mac, wants you to know that it’s cool. When you start up Weedcraft, Inc., it has you choose between two scenarios – a basic one meant to tutorialise you, and an advanced one that throws you in the deep end – and tasks you with starting your very own home-grown cannabis business. Will you keep things shady and sell via dealers? Or will you build a legitimate cannabis empire for medicinal and recreational purposes alike? As a management sim, Weedcraft, Inc. is heaven for tinkerers and obsessives. It’s also a bit straightforward – you’re mostly just managing resources and clocks, and the various systems all fit together in perfunctory ways. You can breed new strains of weed, each with their own set of characteristics like flavor and euphoria. Tinkering with the nutrient balance in your growth medium affects the quality of your harvest, which then tips customer favourability according their preset preferences and the price you set. Your business can be legal, and increased activity will attract taxes and competitors. It can also be illegal, and attract law enforcement unless you invest in the appropriate countermeasures, like air purifiers, bribes, and lobbying. Take, for example, the role playing game-style system you use to interact with its characters. 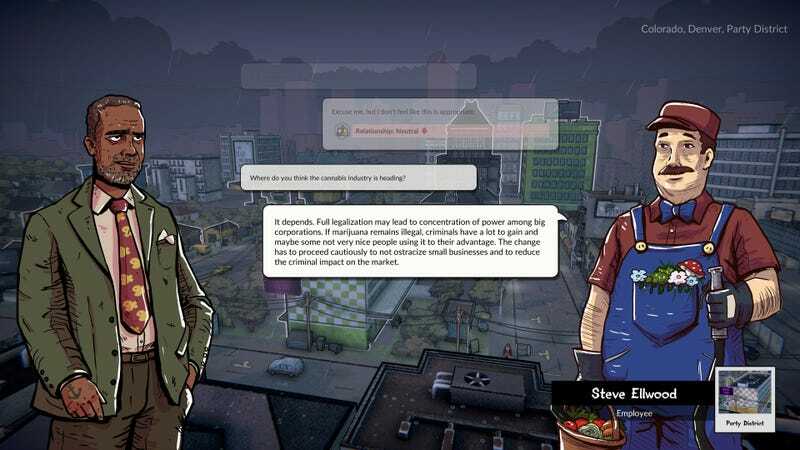 You can talk to any character in Weedcraft, Inc., which offers opportunities to up their stats and attributes. All the characters in Weedcraft have a set of dispositions – maybe they’re an employee uncomfortable with doing illegal things, maybe they’re a cop predisposed to hating your guts. Talking to them will allow you to flesh out more information about that character, which in turn will open dialogue options that can lead to improving said disposition. It’s a very mechanical input-output arrangement that feels barebones compared to the clockwork of the other systems. It does, however, lead to very funny situations – like this familiar-looking man having very strong opinions about the state of the cannabis industry. Were these actual characters instead of just collections of stats, this aspect of Weedcraft could push it over the edge from a game that’s pleasant enough for killing time to a game that lives in your brain and doesn’t let go. Instead, they’re emblematic of the game’s propensity for ignoring the human aspect of its subject in favour of simple maths. 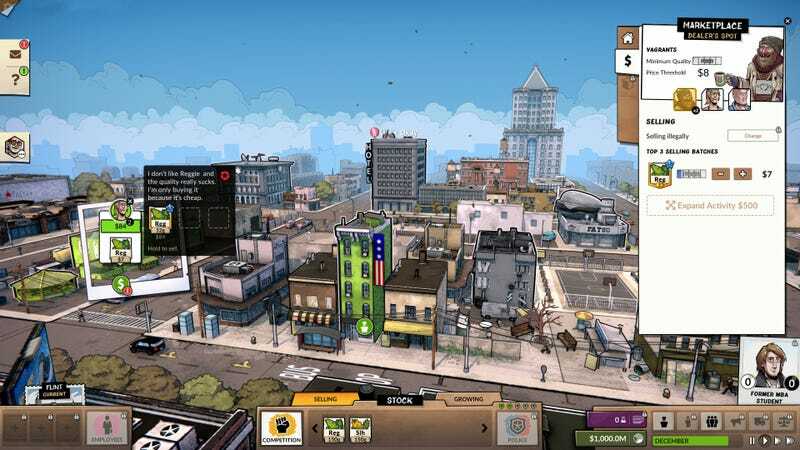 Your customers are glibly categorised under titles like “jocks,” “junkies,” “grifters,” and “PTSD survivors.” The backstories the game offers in its twin starter scenarios – a young man in Flint, Michigan starting a business after his father’s death, and an ex-con in Denver, Colorado starting over – are barely engaged with in the opening hours, even as they directly reference things that should probably be brought up. Weed in America is more than the mere navigation of laws and horticulture: It’s also about how we navigate race. As legalisation creeps across the country, it continues to collide uncomfortably with the lingering racial bias of The War On Drugs, and the disproportionate penalties it has imposed on Americans of color. As a result, the burgeoning legal cannabis industry has overwhelmingly favored white Americans – and years of cultural conditioning has left black and latinx Americans hesitant to join the industry.